Interface is optional. Software sold separately. Use the Vernier Emissions Spectrometer to conduct emissions analysis. It gives precise measurements over a range of 350–900 nm to examine spectra of light bulbs, spectrum tubes, or the sun. This is the perfect tool to conduct emissions analysis. The Vernier Emissions Spectrometer allows you to instantly collect emissions spectra from light bulbs, gas discharge tubes, or the sun. It connects directly to your computer or LabQuest with a standard USB cable and gives precise measurements over a range of 350–900 nm. 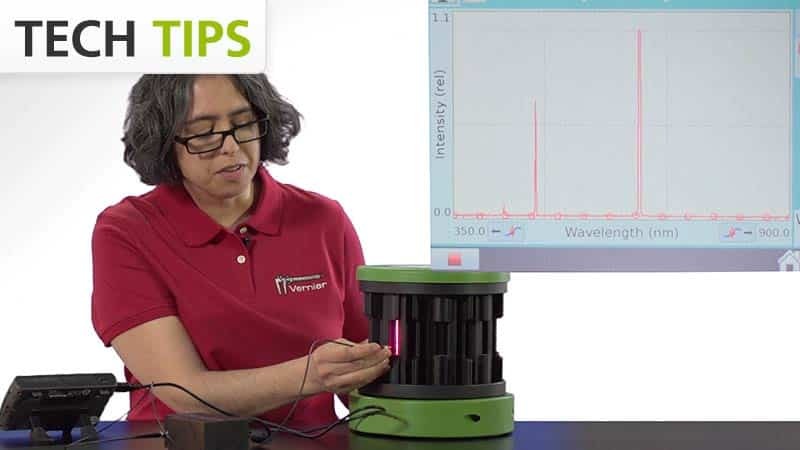 We recommend using the Vernier Emissions Spectrometer without an optical fiber for measuring spectra of large sources, such as the sun, or for comparing types of light bulbs. An optical fiber is recommended for analyzing the emissions of a gas spectrum tube. The Vernier Emissions Spectrometer may require a compatible interface and software. Choose a platform below to see compatible interface and software options. The Vernier Emissions Spectrometer is fully supported with LabQuest 2 (version 2.8.5), a standalone data logger with built-in graphing and analysis software.